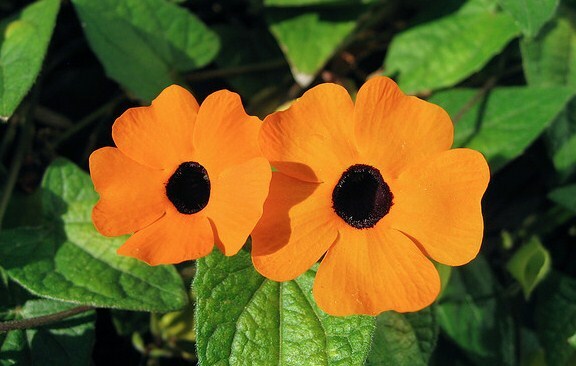 Black Eyed Susan (Thunbergia Alata) is one of my favorite climbers. Fresh green leaves and bright orange and yellow flowers make it an excellent choice for gardeners as a climber of ornamental plant for hanging baskets. Native to Africa and Asia, Black Eyed Susan is easy to grow is most tropical and temperate regions of the world where it can be grown as ornamental climber. Flowers appear in summer and autumn. Propagating from seeds and cuttings, Black Eyed Susan requires moist but well-drained soil. These fast growing climbers prefer full to partial sun and protection from frost. Black Eyed Susan is a perfect climber to be grown against fences, pergolas, trellis, and arches where it can grow up to 8 feet. The name ‘Black Eyed Susan’ is also used for other flowering plants like Rudbeckia and Hibiscus.